Are We Sure This Is Mexico's Largest Marijuana Farm? 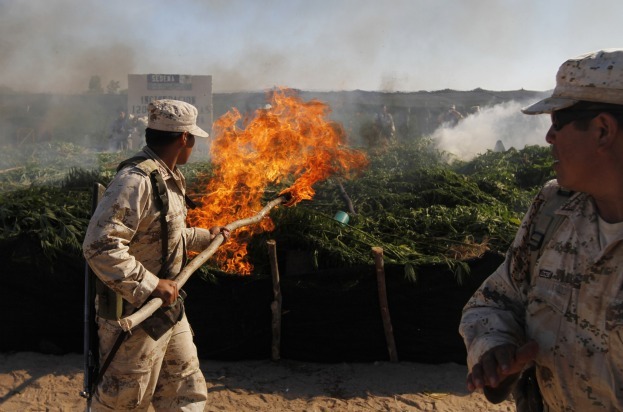 Google "Mexico" and "marijuana" this morning and you'll find many headlines informing you that Mexican soldiers have discovered the country's "biggest" or "largest" marijuana plantation ever in the remote Baja California desert, across the border from San Diego. But look a little closer and you'll see other news outlets hedging; AFP puts 'largest' in quotes, for instance, while The Wall Street Journal goes with the phrase 'large marijuana farm.' Why the discrepancy? It's rather complicated. 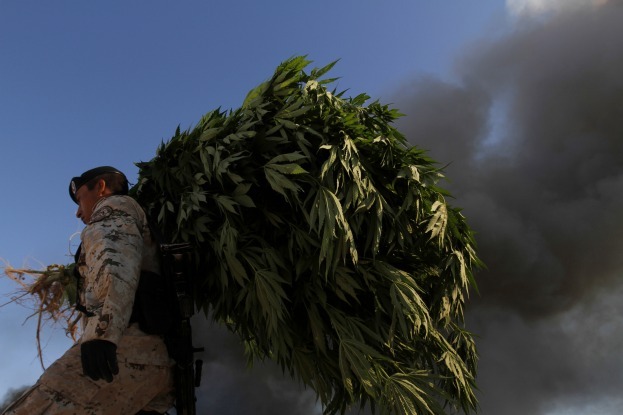 The Mexican army says the 300-acre plantation, which can produce 120 tons of pot worth an estimated $160 million, is the largest in Mexican history and four times the size of the previous record-holder, the "El Bufalo" ranch in northern Chihuahua state that authorities discovered in 1984, according to the AP (AFP, quoting the military, identifies the previous record-holder as an 158-acre farm in the state of Sinaloa uncovered in 2007.) Experts like Alberto Islas, however, are casting doubt on the military's claims, arguing that the Bufalo farm was much bigger than the Baja field. Mexican press reports claim El Bufalo was 1,344 acres and contained anywhere from 2,500 to 6,000 tons of marijuana worth somewhere between $3.2 billion and $8 billion in today's prices, The Journal notes. Islas tells the paper that the Mexican army could be exaggerating the size of yesterday's bust to boost morale as Mexican's violent drug war drags on. A Mexican official, meanwhile, explains that the Bufalo plantation was a series of 13 different fields and the Baja plantation was bigger than any individual Bufalo field. Ah, the difficulty in measuring marijuana plantations.